30 ⅛ x 40 ⅛ in. 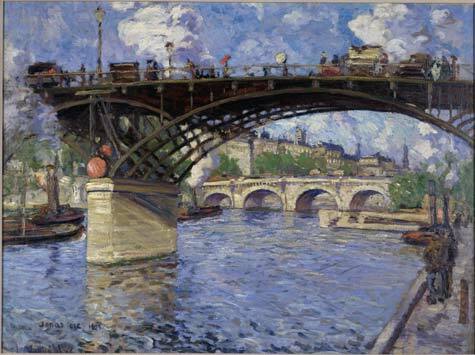 Jonas Lie portrays two highly characteristic bridges spanning the river Seine in Paris. Prominently represented is the Pont des Arts, a cast-iron bridge exclusively used by pedestrians. On this bridge one can see the stalls of the bouquinistes, the Parisian booksellers who sell their books, prints, and postcards from small, movable carts. This trade is still plied along the banks of the Seine. In the background looking eastward is the Pont-Neuf, a stone bridge often painted by Impressionist artists, and the western tip of the Ile de la Cité, the small island on which the cathedral Notre-Dame de Paris is located. Jonas Lie, son of a Norwegian father and American mother, spent his formative years in Norway, Paris, and New Jersey. He studied at the National Academy of Design in New York and regularly returned to Paris to maintain his international artistic contacts. Lie's series of 12 paintings documenting the construction of the Panama Canal is preserved in the Military Academy at West Point.